The Clark family, originally of Paisley, Scotland, and later of Newark, was one of those multi-generational groups to contribute not only to the immediate financial benefit of Newark, but also to its long-range reputation as one of the important cornerstones of America, where all good things were possible with hard work and energy. The Clarks were sold on the old-fashioned virtues of hard work and were extremely successful, but they also were favored with wealth, business ability and foresight, and they operated in a time of expanding and unregulated industry. Over five generations, they moved from Scotland to Newark and later on to the Deep South to become one of the world's leading producers of cotton thread and textiles. Today's evidence of their existence is the shells of some important industrial structures, a truncated smokestack in East Newark and the elegant Clark mansion in Forest Hill, now the North Ward Center. It is interesting to note that if it had not been for Napoleon and his attempts to cut off all sources of flax and silk to British manufacturers in the early 1800s, the Clark Mills might never have been established in Newark. James and Patrick Clark needed raw materials to operate their Scottish mills and were led to use cotton as a substitute. By 1812, James and John Clark were solidly entrenched in the Scottish market. With the demand for even greater amounts of cotton thread spurred by the invention of the sewing machine, the Clarks decided to move part of their Paisley operations to America, where there was an even greater market. In 1855, George A. and William Clark were sent to America to extend the family business. 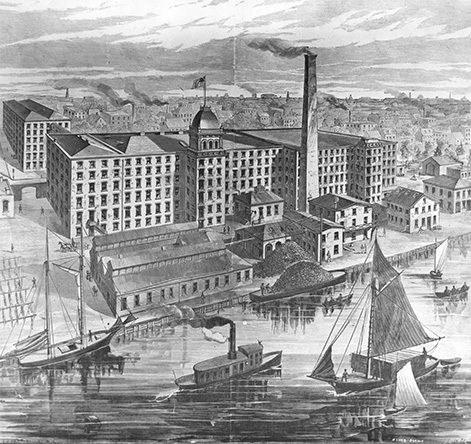 By 1864, they were operating in a rented factory at Front and Fulton streets, and by 1866 they had begun construction of a giant factory along the Passaic River. The firm's first massive industrial phase began under George A. Clark. Under his supervision, what was considered 'one of America's greatest factories' was constructed in just a few years. According to Newark's newspaper of record, the Daily Advertiser, 'the mill was one of the most convenient, extensive and substantial in the country. Four millions of bricks will be used in the construction of six buildings. The main edifice is 323 feet long, five stories high, and 105 by 84 feet in width. 'The turning shop, for turning spools, is 40 by 90 feet, with two stories. The picker house, for picking and blowing cotton, is 48 feet square and three stories high. The bleaching room is 109 by 111 feet, with one story, 20 feet in height. 'The foundation of the main building is composed of solid concrete, a firm mass of stone and mortar. It averages 4 feet in depth. The walls are 3 feet thick at the basement. Two towers stand at the rear, in which are placed stairways in order to afford egress in case of fire. 'A large water tank is situated just above the roof in each tower. The upper story of one is to be fitted with glass windows for the watchman, who will keep a sharp lookout over the entire premises, and give warning of the approach of `river thieves.' Bells will be located there to provide a warning in case of danger.' The fear of 'river pirates' may refer to the Civil War. Northern industrialists recalled that Southerners had conducted raids in the North. In 1873, George A. Clark, the mover and shaker of all these activities, suddenly died of 'heart disease,' never to see the full expansion of his plans. He was replaced by his brother, William, who was to complete their massive plants in the next few decades. After George's death, William almost doubled the company's size. An additional 10 acres were purchased and buildings were erected to accommodate 8,000 spindles along with more engines and boilers. By this time, many more employees were working in Newark. Soon the operations spread across the Passaic River to East Newark, Harrison and Kearny. More than 40 mill buildings covered more than 16 acres in East Newark along Passaic Avenue. These red brick buildings with cast-iron support columns were punctuated with large, rectangular windows with 20-over-20 wooden sashes. But it was the 335-foot-high chimney that commanded attention. When completed, the chimney was the nation's and world's fourth-tallest, and stood on a 40-foot-square cement base. It took eight bricklayers and their assistants 150 nine-hour working days to complete at a cost of $30,000. The amazing thing is that not a single injury occurred during the chimney's construction. It dominated the local skyline until the 1980s, when it was truncated in a modernization of the industrial facilities. By 1897, the Passaic Mills, as Clark Thread was officially known, passed out of the original Clark family. Yet control of the plants remained in Clark hands until 1947, when they were moved to Georgia, following other textile manufacturers who were chasing low-wage workers and fleeing unions. The Clarks' most enduring landmark was not the riverside industrial complex but the elegant home built by William on Mt. Prospect Avenue. The 33-room William Clark mansion, built by one of the Clark Thread Mill founders, has been a showplace since its completion in the 1880s. Designed in Scottish baronial style, it occupies a 21/2-acre piece of land that extends from Mt. Prospect to Clifton avenues, bounded by Treadwell Street on the south. The woodwork in its great central hall, its monumental grand staircase, and its mullioned windows and superbly carved stonework are among the very finest in New Jersey. The building represents wealth and good taste in the grand order, and it was indeed fit for a captain of American industry. Built as the first great mansion in Forest Hill, it survives in magnificent condition today because of the care and attention of Stephen Adubato, executive director of the North Ward Center, who has shown how to achieve a successful adaptive rehabilitation. Since the Clark era, the building has briefly served as a home of the Heller family and as the Prospect Country and Day School. In 1975, Adubato noted, 'No one should live in a place like this. It should be used as we are utilizing it – to fill the needs of thousands of residents.' And so it does today. The busy center fulfills the needs of both young and old in the North Ward of Forest Hill and beyond. A century ago, in 1897, management of Clark Thread passed from William to other Clark family members. While the company continued to expand, building a 150,000- square-foot plant in Bloomfield and remodeling operations both in Newark and across the river, times were beginning to change. So was the local labor market. Clark's managers attempted to foster good relations with labor, garnering much disapproval from other major companies, by opening company restaurants and recreational facilities and sponsoring annual picnics and summer rail outings until the 1930s. In an era when management considered a 'good worker a hungry worker,' the Clarks were even accused of Bolshevik leanings by their peers. Once the first Georgia factory was opened to produce Southern thread, the writing was on the wall for the New Jersey operations. By 1947, the decision to move south was made and the once-mighty company began to leave the facilities at Ogden and Clark streets after 80 years due to labor costs and taxes. Change came with the sale of their Jersey City facility in 1926 and the East Newark mills in 1935. Then the Newark headquarters was sold in 1947. Clark's famous O.N.T. (Our New Thread) now was made in Austell, Ga., a suburb of Atlanta, and a string of plants scattered across that state. According to management, the labor picture in Newark had become too difficult. The city 'had become a hub for electrical instrument manufacturing . . . workers were reluctant to enter the thread mill, where special skill was required, but would rather follow friends and relatives into the electrical plant.' In 1953, the company name changed with the merger of the J.P. Coats Co. of Pawtucket, R.I. The result of the merger was Coats and Clark, one of the world's largest textile manufacturers. An era had passed away. The great manufacturing home in Newark and its twin across the Passaic, built from 1865 to 1888, lay silent. Now, when you cross the Clay Street bridge, eat at Top's Diner, exercise at the Red Brick Gym or deal with any number of businesses at the East Newark industrial complex, remember the name Clark.